Written and directed by Darren Aronofsky, mother! is the story of a couple whose quiet life in the country is disrupted by visitors who come in for some unknown reasons causing all sorts of trouble. The film is an unconventional horror story revolving around unexpected visitors as it explores the idea of idol worship and desires to start a family. Starring Jennifer Lawrence, Javier Bardem, Michelle Pfeiffer, Domhnall Gleeson, Brian Gleeson, Kristen Wiig, and Ed Harris. mother! is a visceral and harrowing film from Darren Aronofsky. The film follows the life of a couple living in the middle of the country as a writer (Javier Bardem) is struggling to write a new book while his wife (Jennifer Lawrence) is finishing the redecoration of their house where they get some unexpected visitors that would shake everything up. It’s a film that explores the idea of worship as the writer is dealing with the expectations of a new book as he has writer’s block as well as the fact that starting a new life hasn’t helped him with his wife seemingly happy with the tranquility in shaping their home. Yet, she would see things such as a beating heart inside the house as if it’s haunted as it would worsen with the arrival of an ailing doctor (Ed Harris) who is later joined by his wife (Michelle Pfeiffer). Darren Aronofsky’s screenplay is filled with a lot of themes as the writer is willing to have guests in his home as the doctor is a fan of the writer’s work as it later goes into chaos due to the people that come to the house. For the wife, it becomes overwhelming as these visitors would disrupt everything as the wife questions her husband’s generosity as she believes he is selfish and often too inviting as well to the point that he neglects her. All of this happens during its first half as the second half becomes about the arrival of a new person for the writer and his wife but also more chaos and tragedy that would loom throughout due to the fact that writer revels in the worship of his readers who have taken his work way too seriously. Aronofsky’s direction is definitely stylish in the way he would open and end the film in the same way as if it’s all part of something biblical. Shot near Montreal, the film is set entirely in a country house in the middle of nowhere as it serves as this kind of idyllic world where the wife is in charge while her husband struggles with trying to write a new book. While there’s some wide shots in the film for much of the exteriors, Aronofsky aims for something more intimate with the usage of medium shots and close-ups as there’s a lot of emphasis on the latter. Notably in moments where the wife would touch the wall as if there is something living in the house as it would show the image of a heart beating as if the house is real. Aronofsky would create moments that are quite calm yet there is something that is uneasy such as the wife’s interaction with the doctor’s wife who would say these very offbeat yet cruel things throughout the film as it would baffle the wife who becomes more uneasy. Another part of Aronofsky’s direction that is unique is the fact that he would shoot close-ups of certain objects as well as the focus of a crystallized object at the writer’s office. Things would intensify during the second act when the doctor and his wife would receive a visit from their two sons (Brian and Domhnall Gleeson) as it adds more chaos where Aronofsky’s usage of hand-held cameras to follow the action would show the sense of disruption at the house. Notably in the third act following the aftermath of the release of the writer’s new book where it’s just mayhem. There’s moments in this sequence that is quite ridiculous as well as grotesque but there’s also some dark humor in the film that add to the insanity of what is happening. Even as the writer is forced to see what his work has done as it adds a lot of religious and biblical allegory into everything that has happened with the wife at the center of it all. Overall, Aronofsky crafts a chilling and intense film about a couple’s tranquil life disrupted by strange visitors. Cinematographer Matthew Libatique does excellent work with the film’s cinematography with the usage of natural colors for some of the daytime exteriors as well as some low-key lighting and moods for many of the interior scenes including the ones at the basement and for the scenes at night. Editor Andrew Weisblum does brilliant work with the editing with its usage of jump-cuts and other stylized cuts to play into the suspense and heightened drama that looms throughout the film. Production designer Philip Messina, with set decorators Larry Dias and Martine Kazemirchuk plus art directors Isabelle Guay and Deborah Jensen, does amazing work with the look of the house and the way the different rooms look as well as how they would look in its decayed form including the basement. Costume designer Danny Glicker does nice work with some of the costumes as it is mostly casual with a bit of stylish clothing from the things the doctor’s wife wears as well as a dress the wife would wear in the third act. Special effects makeup artists Mathieu Baptista and Shane Shisheboran does terrific work with some of the makeup for the look of some of the people that would emerge at the house as it adds to the insanity that occurs in the film. The visual effects work of Kenneth Caines and John Mangia does fantastic work with the visual effects from the look of the heart as well as some of the stranger things that occur in the house that would haunt the wife. Sound designers Paula Fairfield and Craig Henigan do superb work with the sound from the way some of the sounds of the house is presented as well as how objects are heard as it help add to the film’s approach to suspense and horror. The film’s music by Johan Johansson is wonderful as it’s very low-key with its approach to ambient music as it’s used very sparingly as sound texture while the only real piece of music in the film is a cover of The End of the World by Patti Smith. The casting by Lindsay Graham and Mary Vernieu is incredible as it feature some notable small roles and appearances from Stephen McHattie as a zealot, Kristen Wiig as the writer’s publisher, Jovan Adepo as a mysterious cup holder, and the duo of Domhnall and Brian Gleeson as the feuding sons of the doctor and his wife. Ed Harris and Michelle Pfeiffer are phenomenal in their respective role as the doctor and his wife with Harris as this kind and curious man that is eager to meet the writer as he is becoming very ill while Pfeiffer is just sublime as this very bitchy and intrusive woman that wants to know what is in the mind of the wife. Javier Bardem is remarkable as the writer as this man that is struggling to write something as well as be attentive to his wife where he’s trying to find inspiration as it’s a very complex role of a man trying to be this figure for his adoring fans but also be there for his wife. 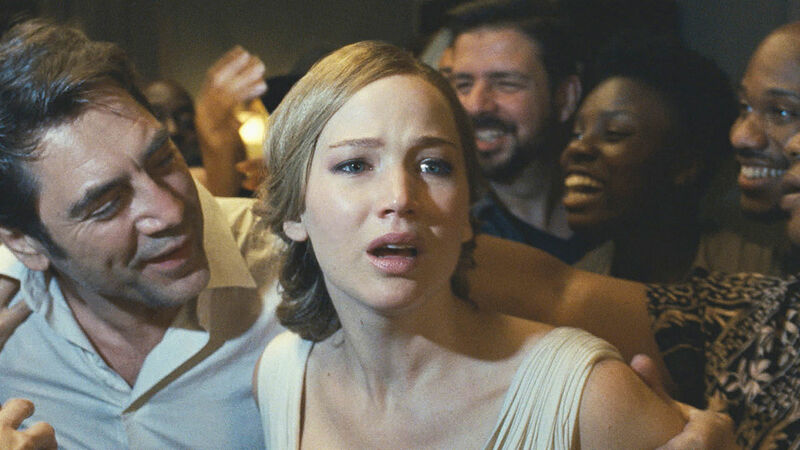 Finally, there’s Jennifer Lawrence in a sensational performance as the wife as this young woman struggling to create a life for herself and her husband as she deals with these intrusive visitors as well as the neglect she’s getting from her husband as it’s a role of anguish and terror of a woman trying to protect the home she’s created. mother! is a marvelous film from Darren Aronofsky that features incredible performances from Jennifer Lawrence, Javier Bardem, Michelle Pfeiffer, and Ed Harris. Along with its eerie visuals, biblical references, eerie suspense, and moments of horror, it’s a film that is willing to push all sorts of boundaries and raise discussion though some of its presentation is flawed. In the end, mother! is a riveting film from Darren Aronofsky. I can't stop thinking about this movie. I'm with you, it is flawed but it was a hell of an experience. @Brittani-It is a hell of an experience though there were parts that were ridiculous but at least made me laugh. It is flawed but certainly worth watching. @Sati-I hope you enjoy it but also not take it too seriously. Even if it won't work for you as it's definitely a polarizing film. Response to this movie has been divisive to say the least. But I'm highly intrigued by it and when I'm not busy, will have to see it. I enjoyed your positive take. @vinnieh-See it immediately as you can as it's likely not to stay long in the theaters since it's not doing well commercially. It's one of those films where you either enjoy it or you don't. Saw it the other night in an almost empty cinema and was glued to the screen. To me, it's this years Neon Demon, a twisted film that isn't for everyone. In my top 5 of 2017 so far. @Chris-It's not in my top 5 films of the year so far but still made the list as it is a really a good film though it's flawed. I recently took a quiz from Vulture about what I would think about the film if I hadn't seen it and it said that I would hate it which is absolutely wrong. So happy you liked this one. I agree, this is a boundary pusher if there ever was one. Still can't believe a major American studio agreed to make this. Love it. @Alex Withrow-It is shocking that a studio would make this as I'm glad they're supporting it. It is meant to provoke despite the fact that the film does have some flaws but still worth watching. @TheVern-It's a bonkers film but certainly fun to watch. It has some flaws and moments where I unintentionally laughed but I still think it's worth seeing and I'm glad it's able to provoke.